Want to know who will win today? In Today’s Dream11 Fantasy Cricket Prediction KXIP vs RR 40th T20 Match IPL 2018, we will cover playing 11, pitch report of Sawai Mansingh Stadium, Jaipur, toss prediction. We will also cover all the latest news and updates of Rajasthan Royals and Kings XI Punjab, players recent and past performance, dream11 guru prediction, key players, the best choice for captain and vice-captain, weather report of Jaipur, dream 11 best team, where to watch the live match of RR vs KXIP and details of live streaming. All the details that we provide are taken from very reliable sources. Make sure to read the complete post to get 100% benefit. All the section of the has some important data and details so make sure to read the full post. All the details that we provide are absolutely free. Where Can You Watch the Live Streaming of KXIP vs RR or Channels to Watch? Who Will Win the 40th Match of IPL 2018 Between KXIP vs RR and Toss Prediction? What is the best combination of players for Dream11 in 40th Match? Date: The match will be played on 8th May 2018 (Tuesday). Match: Indian Premier League, RR vs KXIP, IPL 2018. The pitch of Sawai Mansingh Stadium is a batting friendly pitch but scoring big runs will be difficult on this pitch as the ground is very big. The players who will play shots down the ground will be benefited the most. Seamers and the spinners will also get some help from the pitch. It will be interesting to see department takes most benefit out of it. On Tuesday, in Jaipur, there will be a thunderstorm but it will end before the start of the match. In evening it will be partly cloudy. At the time of the play, the sky will be almost clear. No rain is expected in today’s match. The temperature is expected to be 31-Degree Celsius and the humidity to be 34%, which may rise up to 40%. In last five matches, RR won only one match out of five and KXIP won 3 games out of five. One match was a tie. In overall encounters, RAJ won nine times and PNJ won six times, and one match was a tie. At this venue, KXIP has never won any match against RR whereas RAJ has won 4 matches against PNJ. Star Sports has paid a huge amount of INR 16,347.50 Crores to get exclusive rights of IPL 2018 for live coverage for five years starting from 2018 to 2022. Star Sports has all the media rights including TV and all Digital Rights. You can watch the full match of Kings XI Punjab vs Rajasthan Royals, 40th match on Star Sports. D Arcy Short, Jos Buttler (wk), Ankit Sharma, Ajinkya Rahane (c), Anureet Singh, Ben Laughlin, Sanju Samson, Heinrich Klaasen, Ben Stokes, Jatin Saxena, Rahul Tripathi, Shreyas Gopal, Jofra Archer, Dhawal Kulkarni, Krishnappa Gowtham, Dushmantha Chameera, Jaydev Unadkat, Mahipal Lomror, Stuart Binny, Aryaman Birla, Prashant Chopra, Ish Sodhi, Sudhesan Midhun. Chris Gayle, Lokesh Rahul (wk), Manzoor Dar, Ravichandran Ashwin (c), Mujeeb Ur Rahman, Mayank Dagar, Mayank Agarwal, Mohit Sharma, Karun Nair, Ben Dwarshuis, Axar Patel, Akshdeep Nath, Marcus Stoinis, Yuvraj Singh, Manoj Tiwary, Aaron Finch, Andrew Tye, Barinder Sran, Ankit Rajpoot, Pardeep Sahu, David Miller. Rajasthan Royals and Kings XI Punjab will play against each other in less than three days time. KXIP is at 3rd position in the points table whereas RR is at the last spot. RR has to win this match if they want to book their spot for playoffs. It will be interesting to see how they make their winning combinations. D’Arcy Short has continuously failed to score runs in this IPL season. This may lead Rahane to bring Heinrich Klaasen in place of him. Anureet Singh may have to make a way for Dhawal Kulkarni. Ben Stokes looked good in the previous innings and he may continue his form in this match. D’Arcy Short/Heinrich Klaasen, Sanju Samson, Jos Buttler (wk), Jaydev Unadkat, Ajinkya Rahane (c), Ben Stokes, K Gowtham, Shreyas Gopal, Rahul Tripathi, Jofra Archer, Stuart Binny/Dhawal Kulkarni/Anureet Singh. Kings XI Punjab has done well in the last game. It is very unlikely that he will make any change in their playing 11 for today’s match. You will only see a change in the team if there is any series injury. KL Rahul (wk), Yuvraj Singh/Manoj Tiwary, Mujeeb Ur Rahman, Marcus Stoinis, Chris Gayle, Andrew Tye, Mayank Agarwal, R Ashwin (c), Karun Nair, Ankit Rajpoot, Axar Patel. Pro tips: Both the players are good. You can take any one of them. For multiple teams make a combination of the above players. Pro tips: The above players are most likely to perform today. Make a combination of the above players. Pro tips: the above players may take wickets in today’s match. Make a combination of the above players for multiple teams. Rajasthan Royals are in a do-or-die situation. They have to win today’s match if they want to go to the playoffs. On the other hand, Kings XI Punjab is in a comfortable position but they will not take any risk. On papers, RR is a weak team. Experts say that KXIP will win the match but according to our astrology prediction, RR will win today’s match. The team winning the toss will opt to bowl first as chasing in this ground is comparatively easy on this ground. According to our astrology prediction, KXIP will win the toss and they will ask RR to bat first. Taking spinners in this pitch will be a wise choice in this pitch. Take hard hitters in your team as most of the runs will be scored in the powerplay. Try to keep Rahne in your team as he has an average of almost 46 on this ground. 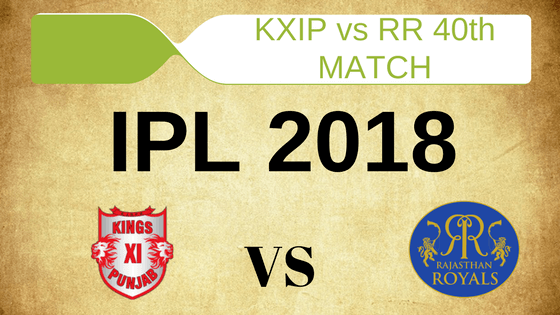 Conclusion: This is it for Today’s Dream11 Fantasy Cricket Match Prediction of KXIP vs RR, 40th T20 Match, IPL 2018 which will be played on Tuesday 8th May. You can give your valuable feedback in the comment section. Subscribe to our notification of latest updates. GOODBYE!